One of the many touching scenes in Titanic is the moment when the musicians decide to go on playing. There they are in their formal suits, instruments at the ready, and their future is already clear, there seems to be no hope for their survival as their place in the queue for a seat in a lifeboat is very near the back. Who would forgive them for going off for a smoke, or going to look for a stiff drink in the unattended bar? Who would be left to reprimand them for not finishing their set, and what little chance was there that they would be alive long enough to be reprimanded anyway? Yet, given the choice which faced all the persons aboard the stricken ship, they opted for courage instead of cowardice, for honour instead of skullduggery, and their actions earned them a place of pride in …… the story or in history? One of the difficulties of James Cameron´s film is that it mixes fact and fiction, hard truth and fairy tale. So I was very touched to come across a plaque honouring these musicians, and confirming that the scene played out in the movie chimed with reality. The last time I visited the Philharmonic Hall in Liverpool, England, was in 2008 and the large wooden plaque is on display for all to see just inside the beautiful art deco style building. The names of the musicians are listed, with a brief note of tribute to their heroism and their musicianship. I was curious about this plaque because I was fortunate to hear many concerts at the hall given by the Royal Liverpool Philharmonic Orchestra (RLPO) in the ‘70’s and I could not understand how I had not noticed it. Our guide explained that it had been hung in the band room in the months after the Titanic sank, and for many years orchestra players touched it on their way onto the stage as a good luck charm. When the building was renovated recently, the impact of the movie had been so great that the orchestra members thought there would be sufficient interest among concert goers to see this very original memorial to some very special musicians. "The Royal Liverpool Philharmonic Orchestra is the UK’s oldest surviving professional symphony orchestra and the second oldest concert-giving organisation in the UK. 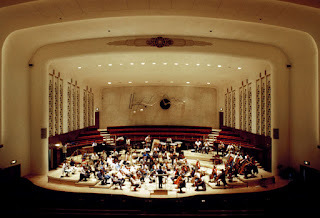 The origins of the Orchestra’s concert series date back to the formation of the Royal Liverpool Philharmonic Society, which administers it, by a group of Liverpool music lovers in 1840. Liverpool Philharmonic has remained at the heart of Liverpool’s cultural life ever since." Like many arts institutions in the UK, the RLPO is extremely aware of its changing role in society, and it is among the most adventurous orchestras in its programming and in special projects. I have written with admiration about the orchestra's commitment to promoting social inclusion under the direction of Peter Garden as Executive Director (Learning & Engagement). The orchestra was so active when Liverpool was European City of Culture in 2008, it was said that the RLPO provided the soundtrack to the year’s events. There is a footnote not told in the movie: the notes on the plaque go on to explain that it was the custom for musicians to hire their suits when they went to work on the ships. Apparently the tailor from whom these brave men had hired their suits sent a bill demanding payment from their families in the days following the disaster. There was such a huge outcry in the local press that the tailor was forced to withdraw his demand for payment and forgive the debt.